In case you missed my post last week, I shared a gluten free & top 8 allergy free Hamantaschen recipe. Hamantaschen is a traditional Jewish cookie enjoyed at Purim. This year, Purim begins at sunset on March 15th and ends at nightfall on the 16th. I love teaching Little Miss about different religions and beliefs, especially because good friends of ours are Jewish and I want her to understand and respect their traditions - just as I would want the same from their children, towards us. As I mentioned above, Little Miss and I started to discuss what Purim was while making our Hamantaschen cookies. Purim celebrates the time when they were living in Persia and saved from a plot to destroy them - It's recorded in the Book of Esther. Hamantaschen cookies are triangular in shape and eaten in memory of Haman's three cornered hat he wore. 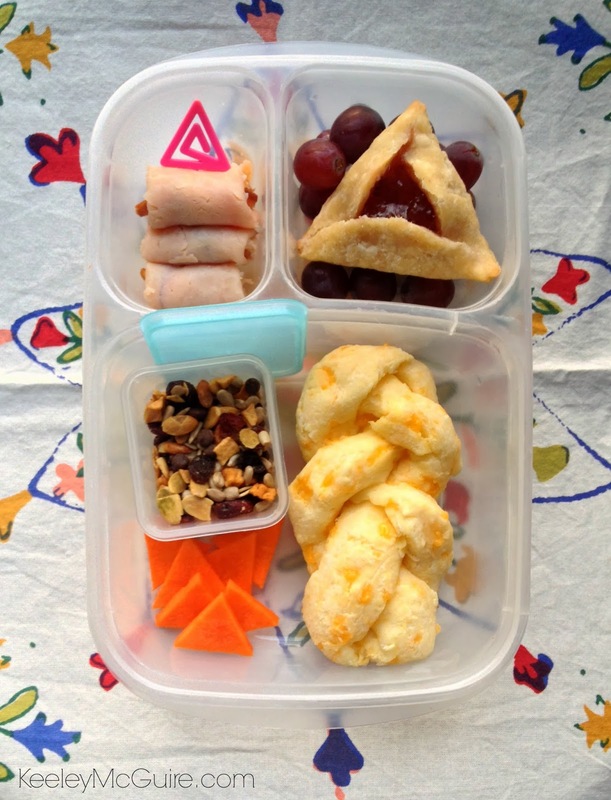 Other triangular shaped food is also enjoyed during Purim. Many eat poppy seeds, or other seeds, because it's said that Queen Esther ate only seeds and legumes when she lived at the King's Palace to remain kosher. 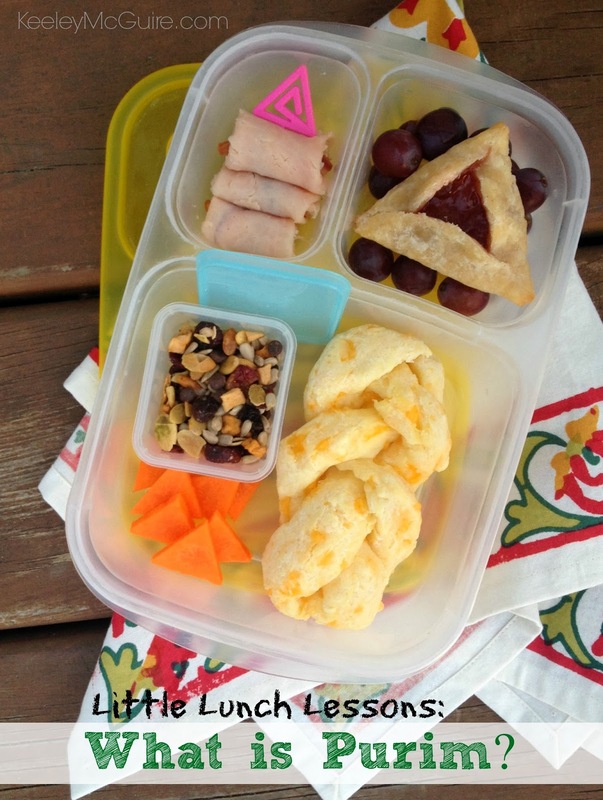 I wanted to keep Little Miss' lunch symbolic but also realistic for her allergies and school. I made braided bread from gluten free & allergy friendly Chebe Bread Mix. It's sort of like a "faux Challah Bread", if you will. Roll with me on this... I've never actually tried braiding bread before so I thought the mini loaves turned out adorable. I also have packed in a Mini Dipper container Enjoy Life Foods gluten & top 8 allergy free Seed & Fruit Mix to represent the seeds that Queen Esther ate while living in the palace. I cut carrots into triangles and packed one of our Hamantaschen over a bed of grapes. The upper left compartment also contains turkey roll-ups on a triangle pick. Again, the triangles are meant to represent Haman's hat. Love this lunchbox! I used to dress up as Queen Esther for Purim each year when I was little. I'll try to make those Hamantaschen for my little allergic girl.. and maybe some braided bread, though since she's allergic to eggs it won't actually be traditional challah. What a fun lunch - and I love the symbolism!